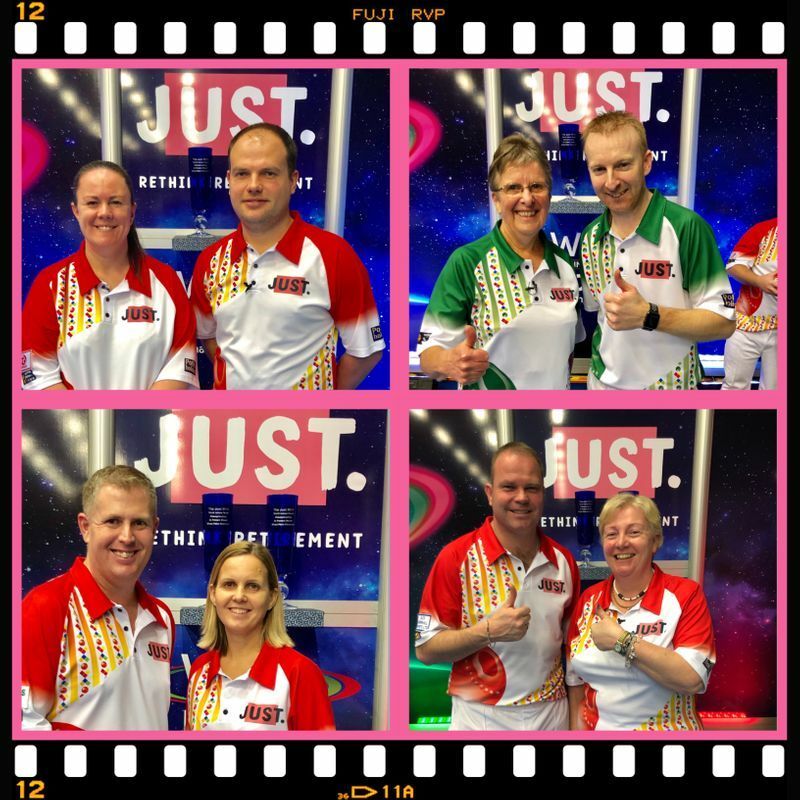 Sunday’s semi-finals of the Just World Mixed Pairs is sure to be a highly popular day with full house crowds guaranteed at the 5* venue in Hopton on Sea. Holders Lesley Doig and Jamie Chestney will be joined by 2017 holder Nicky Brett and his new partner Helen Carman from New Zealand, who is making her debut in the event, meet in the first semi while 2015 winner Rob Paxton teams up with Ellen Falkner against 2013/14 back to back winner Paul Foster and who is partnered this time round by WBT bowls commentator Janice Gower in the second semi. As today’s quarter finals unfolded, defending champions Lesley Doig from Scotland and Exeter’s Jamie Chestney ticked all the boxes as they came through their opening in the best of two sets of seven ends, and quickly asserted their authority, getting the better of their all English opponents Katherine Rednall and Greg Harlow 8-1, 8-5. Now in its 16th year, when Alex Marshall MBE and Amy Monkhouse won the inaugural title in 2004, Rednall is no stranger to success in this event, winning the title three years ago with Darren Burnett, while Harlow’s success came back in 2007 with England’s Jo Morris. In the second match of the day, Nicky Brett and debutant Helen Carman from Dunedin also proved their hand and will provide the opposition for reigning champions Doig and Chestney on Sunday. They were in great form to pull off a 13-2, 7-4 victory, beating Stewart Anderson and multi decorated Guernsey player Alison Merrien MBE. Over the course of the first set, three trebles and two doubles for the loss off a double on the third end saw them get the thumbs up with an end in hand and they maintained that standard in the second, opening up a 6-1 four end lead and going on to win in straight sets. The third match was the closest of the day with Rob Paxton, the winner with Marion Purcell from Wales in 2015, linked up this time round with seasoned campaigner Ellen Falkner and they maintain their challenge after beating the all Scottish pairing of Julie Forrest and 2016 winner with Katherine Rednall – Darren Burnett. The English twosome snatched the first set with a 3 and 2 finish to win 7-5 and in the second built up a 5-1 lead, then wrapped up their straight sets win 7-4. Bringing the day of Mixed Pairs confrontations to an end was three time winner David Gourlay and new partner Melanie Darroch from Elgin. They lined up against back to back champion in 2013 and 14 Paul Foster and his new charge of Janice Gower. There was nothing to separate the teams with the first set drawn at 4-4, but the Foster/Gower combo powered home in the second 9-1 with and end in hand. Saturday (19th Jan) will be ‘wall to wall Ladies Day’ at Potters with the Women’s World Matchplay Singles coming under the hammer. Eight ladies will be vying for a place in Wednesday’s semi-finals and defending champion Katherine Rednall opens her title defence in the first game of the day against Scottish qualifier Melanie Darroch.